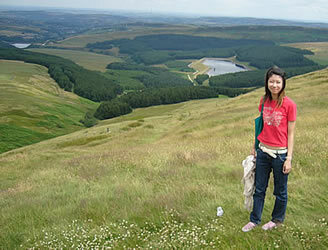 The Peak District is a large National Park which is close to the major cities of Manchester, Sheffield and Derby. 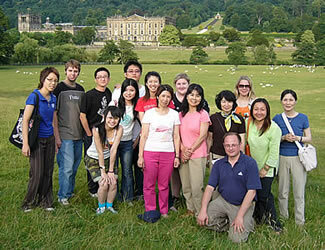 Many people visit this area to go walking or to take part in a wide range of sports. 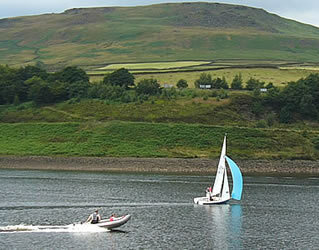 Longdendale Valley is in the northern part of the Peak District. 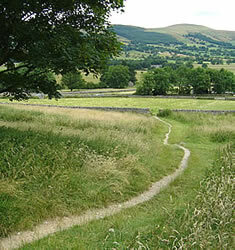 The soil in this part of the park is dark, and it is covered mainly with moorland and forests. Grouse (a type of wild bird) live in the woodland, and are hunted at certain times of the year. There are several reservoirs which are used to provide water to the neighbouring population centres. 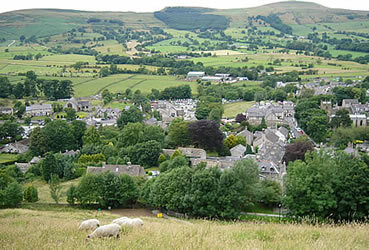 Castleton is a beautiful village in the middle of the Peak District. 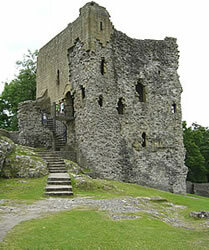 You can follow the side of the river up the hill to go to see the ruins of Peveril Castle, which was built by the son of William the Conqueror and gives you good views of the surrounding area. Alternatively, you can spend time in the local tea-shops or crafts shops, and you can buy jewellery made from a local stone called Blue John. 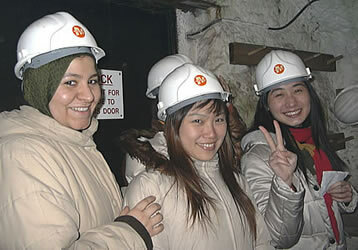 Around Castleton are a series of caverns (underground caves) which can be visited. The limestone soil is much lighter than the stone found in the northern part of the Peak District. 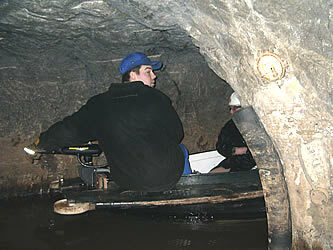 Speedwell Cavern used to be a lead mine and contains a flooded tunnel which leads to a lake known as a "bottomless pit". You can take a boat ride to go and see this. 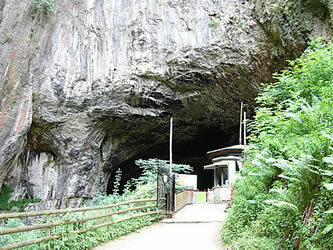 Guided walking tours are also available in the Peak Cavern (also known locally as the Devil's Arse). ... before taking the boat to the "bottomless pit"
Buxton is the largest town in the Peak District, with a population of about 20,000. 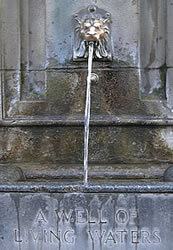 It is most famous for its mineral water, which can be sampled from a public fountain in the town. The Crescent was built in 1780-90 (during the Georgian period of British history; see: Britain/History/Georgian), copying the similar crescent in the other spa town of Bath (see: Travel/Tours/England/Bath). "A well of living waters"
There is an attractive view from Monsal Head. 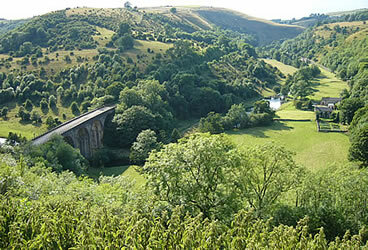 The hills are known as Monsal Dale. The Midland Railway used to cross the viaduct, but this is no longer used except by walkers. 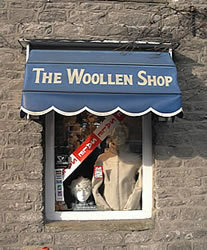 Bakewell is a small market town with a population of about 4,000. One of its most attractive features is a medieval bridge with 5 arches which crosses the River Wye. There are pleasant walks along the river. 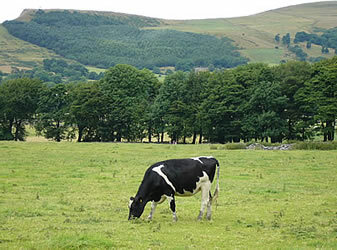 This is an agricultural area, and holds a regular cattle market. Two shops in Bakewell each claim to have the oldest recipe: The Old Original Bakewell Pudding Shop on Bridge Street, and Bloomers Original Bakewell Pudding Shop on Water Street. 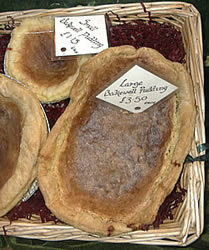 Bakewell pudding (often served with hot custard) is a popular dessert in places which serve traditional British food. 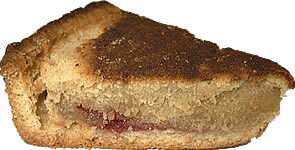 Smaller versions (usually known as Bakewell tarts or Bakewell slices) can be bought in bakeries or supermarkets throughout the UK. 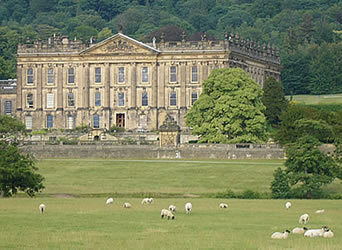 A couple of miles east of Bakewell there is a magnificent country house called Chatsworth. Sheep graze in the parkland around the house. The house and its gardens can be visited during much of the year. 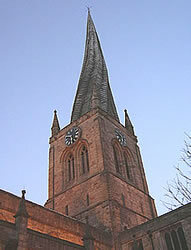 The next major town is Chesterfield, which is famous for its church (St Mary & All Saints Church), which has a strange crooked spire. 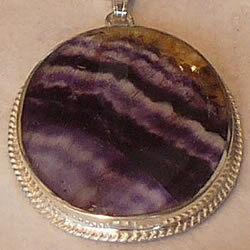 There are many legends which try to explain the reason for the unusual shape. One story which is popular with the locals is that a virgin was once married inside the church, and the spire was so surprised about this that it bent down to look - it will only become straight again the next time that a virgin is married there ...! - Train journeys from Manchester to Chesterfield take about 1h20. Train journeys from London St Pancras to Chesterfield take about 2 hours. For train timetables and to buy a ticket online, see: Shop/Company/TheTrainline. - By coach direct services take about 3h30 to Chesterfield from London's Victoria Coach Station. For timetables and to buy a ticket online, see: Shop/Company/NationalExpress. "The Peak District National Park is a remarkable region, with pretty villages, historic sites, grand houses, fascinating limestone caves, the southern-most hills of the Pennines, and some of England's most wild and beautiful scenery ... To escape the crowds, you should avoid summer weekends, but even then, with a bit of imagination, it's still easy enough to enjoy this wonderful area in relative peace and solitude"